Noting the repressive and highly restrictive atmosphere imposed on West Papua by the Indonesian government, the Australian Senate passed a motion on Wednesday [1 October 2014] calling for increased openness in the region, in particular regarding greater press freedoms. It also voiced concern for the two detained French journalists. The Australia government has also signed a petition calling for more journalistic freedom in West Papua, and it is hoped that these actions will help draw further international attention to the issue. The Abbott government has risked insulting Indonesia again by calling explicitly for more openness in its most sensitive province, West Papua. 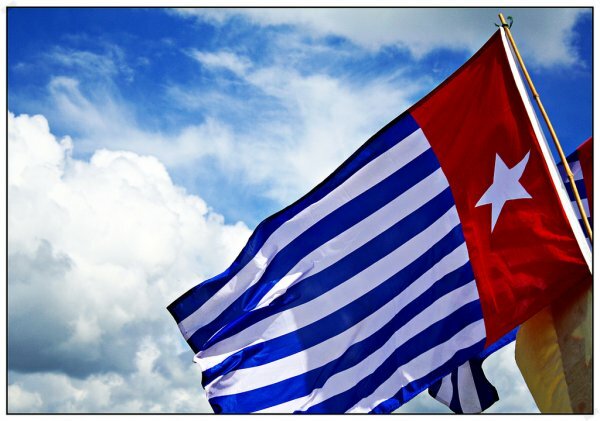 A Senate motion passed on Wednesday [1 October 2014], with the explicit support of Foreign Minister Julie Bishop's office, notes that press freedom in West Papua is "tightly restricted" by the Indonesian government. The motion expressed concern at the imprisonment of two French journalists for working in the separatist area on tourist visas, and called for their release. It's highly unusual for the government to support a motion on a sensitive foreign affairs issue. These are routinely denied because the Senate is not considered the appropriate forum. It's even more unusual because the subject was West Papua. Indonesian president-elect Joko Widodo has given some indications he would ease restrictions in the sensitive province. "This has clearly been considered in detail by the foreign minister's office, and I was really encouraged to receive communications from them," Senator Di Natale told Fairfax Media. "It's in that context that I can only … interpret this support as a gesture that the government is actively sending a very clear signal to the Indonesian government". It seemed "a very deliberate shift in policy," Senator Di Natale said. Indonesia is hyper-sensitive about West Papua, which has hosted a low-level separatist insurgency for 50 years, and Australian governments of both persuasions have also become sensitised. In 2006, the Howard government's acceptance of a group of 42 refugees from the province caused a stand-off during which Indonesia withdrew its ambassador for several months. That fight was resolved with the negotiation of the Lombok Treaty, in which Australia expressed full support for Indonesia's territorial sovereignty. In 2012, the then Labor government and the Coalition even refused to support a condolence motion for a dead Australian activist because it mentioned in passing her concern for West Papua. The motion passed on Wednesday [1 October 2014] was significantly stronger. The Senate noted that access to the Papuan provinces by foreign journalists was "tightly restricted by the Indonesian Government", and called on the Australian government to "request that the Indonesian government release [two imprisoned French journalists Thomas] Dandois and [Valentine] Bourrat as a sign of its commitment to more open Papuan provinces". It expressed concern at their detention and commended president-elect Joko Widodo for indications that he would ease restrictions. The motion risks a strong political backlash in Indonesia. The head of the international relations department at the University of Indonesia, Evi Fitriani, said Senator Di Natale would be better off investigating the "limited journalist access to information about the treatment of irregular migrants by Australians". Asked about the Abbott government's apparent change of heart, she said: "Well, he has irritated Indonesia several times before. No surprise." Ms Bourrat's mother, Martine, who is in Indonesia en route to see her daughter in Jayapura, West Papua, welcomed the Senate motion. "We don't have the same in France. It would have been, for us, a great support to read this in French," Ms Bourrat said. "It's an example. It's an idea to send this to the European parliament."